Posted on 09.11.13 by Oggy. The offseason brings with it hope, intrigue and uncertainty. The preseason brings with it, frankly, very little. And then there is Week 1. It is the first opportunity to assess teams and players ahead of a gruelling and unpredictable season. It is easy to resort to hyperbole and bold proclamations because, finally, after what seems like an eternity, our intense appetite for competitive action has been satiated. But it will be a while before we truly know whether what we saw over the past few days contained genuine precursors as to what lies ahead or were simply mirages. The no-huddle philosophy is a simple one. The pleasant subsidiary effect of a fast pace is that it exhausts the opposing defence and provides no opportunity for substitutions. However, the primary purpose is largely a numbers game. No-huddle means increasing your number of plays in a game. If the success rate of your quarterback, running back or receiver is greater than 50%, then it ensures that proportionately more yards are gained at the expense of less negative plays. In other words, you give your efficient players more opportunities to be efficient. The no-huddle philosophy works perfectly when it is married with a quarterback like Peyton Manning or Tom Brady. But what about the seemingly archetypal Michael Vick? The reality is that he is a great fit if you are only focusing on the subsidiary effect of the no-huddle philosophy, (i.e. causing fatigue to the defence), but not so much if you target efficiency. This seems counterintuitive because, against the Redskins, Vick threw for 2 touchdowns with 60% pass completion and no interceptions. However, Vick’s contribution begins to look less impressive when we take a look at his Win Probability Added (“WPA”) and Expected Points Added (“EPA”). WPA has been used in baseball sabermetrics for years. It measures each play in terms of how it increased or decreased a team’s chances of winning a game (see advancednflstats.com for more). For example, at the start of the 2nd quarter, a team down by 7 points on 2nd and 5 from their own 25 wins about 36% of the time. Accordingly, their WP is 0.36. If the next play is a 30-yard pass by the quarterback resulting in a first down on the opponent’s 45, the WP changes from 0.36 to 0.39, so there is an increase of +0.03 that is attributable to the quarterback. Conversely, an interception returned to the line of scrimmage results in a decrease of the WP to the tune of –0.08. Lost yet? Stick with it for an interesting payoff. EPA measures the true value of a football play, as opposed to simply the yardage that is achieved. For example, gaining 6 yards on 3rd and 5 is far more important than gaining the same 6 yards on 3rd and 9. Consequently, yards are valued against down and distance situations resulting in a calculation of the expected points added as a result of a given play. So now we come to Michael Vick. While his yards and completion percentage are serviceable, his WPA in Week 1 was -0.17 (26th in the league) and his EPA was -8.6 (31st in the league). Compare this to a middle-of-the-pack Andy Dalton, whose WPA was +0.09 and EPA was +7.3 in a loss. Compare it further to LeSean McCoy whose WPA was +0.14 and EPA was an impressive +10.2. This indicates that Vick was not an integral part in Kelly’s system. Instead, Kelly’s system flattered Vick by bolstering his stats with more plays that were actually less impactful on the score. If anything, Vick held back the system. The no-huddle philosophy suited the Eagles perfectly in Week 1. But then there are two key variables to consider. Firstly, as it was Week 1, bodies were fresh. Secondly, the players had an extra incentive to play that little bit harder given that they had a new head coach to impress. 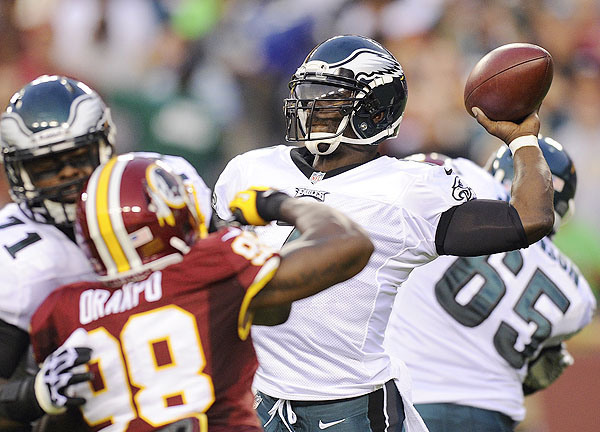 Moving forward, Vick may not be quite the prototype Kelly-quarterback we initially anticipated. No-huddle offenses tend to work more with traditional pocket-passers like Brady and Manning that stay protected and comparatively fresh. Vick, meanwhile, has missed 12 games in the last 3 seasons. Also, despite his prior hiatus from the league due to his extracurricular activities, his rushing exploits mean that in quarterback terms he is not a young 33 year-old. McCoy looked insatiable against the Redskins with 31 carries. However, he missed 4 games last season; a season in which he only averaged 16.7 carries. McCoy’s career average is 14.4 carries a season and the one time he played a full 16-game season was in his rookie year. His ability to keep up with an increased workload will therefore really be put to the test. There is one final point to consider. Last season, teams in the NFL averaged around 64-65 plays per game. The league leader in plays per game over the past two decades has tended to fluctuate between 68-69 plays. The New England Patriots are the outlier, averaging 74 plays a game last season. The Eagles ran 77 plays on Monday. If we extrapolate an average of 74 plays throughout this season, that would result in 9 extra plays per game above the league average. Multiplied by 16, this means 144 extra plays. Or, if you prefer, it translates to more than the amount of plays that are ordinarily executed in 2 games. Remember how vehemently the players protested against an 18-game regular season? We were told that it would require an inordinate amount of physical exertion and that it would significantly heighten the risk of injury. The Eagles would essentially be trying to condense the same exertion into the existing framework of a 16-game season. London Fletcher’s concerns may be well-founded. It was just his luck that he ran into Chip Kelly and the Eagles’ perfect storm in Week 1.